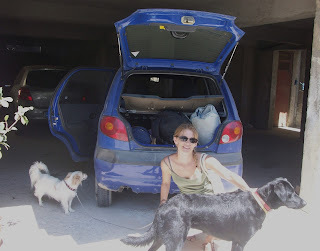 We set off a bit late in the day, and drove through the midday heat from Heraklio to Vrises, on the national highway. Turning inland at Vrises, we started up through the White Mountains. This road passes through spectacular scenery, right on the outskirts of the mountain range. It's pretty deserted, and dry, and wild. Not a great point, in other words, to start having car problems and bunny-hopping up steep mountain roads. At this point I was having serious doubts about my plan. We limped up the mountain as far as Askifou, near Petres in the Sfakia area, and stopped at Karkanis Bakery and Cafe. There were a few tavernas at this point, with panoramic views over a beautiful, fertile plateau to the east of the road between Vrises and Xora Sfakion. I'm sure most of them would have allowed us to sit with our two hot and bothered dogs, quietly at our feet. It was a welcome break anyway, for us and for the car, and we continued on the dizzying road down to the coast. Arriving at Hora Sfakion, just about keeping the car-sickness at bay, we were met with a chaos of parked cars and ticket booths. In the end we found a parking spot by the port, and without knowing what we were going to be able to do, we paid for 2 nights parking (3 Euros per day). I was so relieved to be out of the car, I quite enjoyed Hora Sfakion. 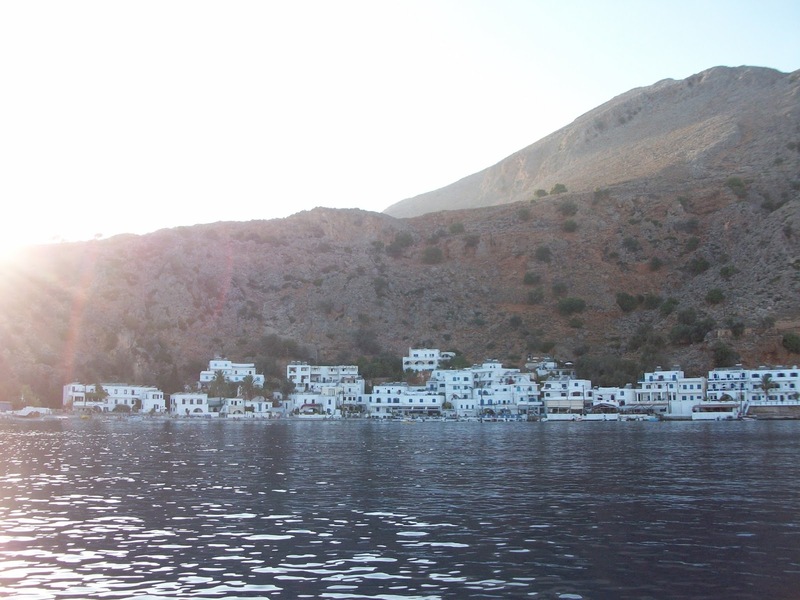 It does slightly have the feel of a waiting room, as ferries leave from there to various destinations - Loutro, the island of Gavdos, Agia Roumeli, Sougia - but it is pretty, with a few tavernas and small hotels clustered around the harbour and a dramatic backdrop of the mountains behind. Asking around the port, we learned that tickets to Agia Roumeli (our goal) cost 13 Euros return per person, and that dogs are permitted onboard. I think a single ticket was 15 Euros, but since the return is open, it makes sense to book both ways. There are 3 boats per day during the summer. 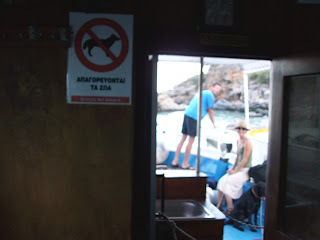 To travel to Agia Roumeli by water-taxi, according to one office anyway, costs 90 Euros!!! We decided to wait for the ferry, of course. 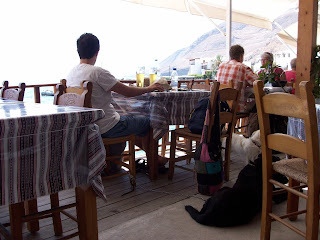 As we had about 3 hours to wait for our boat, we found the nearest taverna - the Delfini - and happily past the time taking turns to swim while the other sat with the dogs, drinking cool beers, and eating. Not bad for a 'waiting room'. 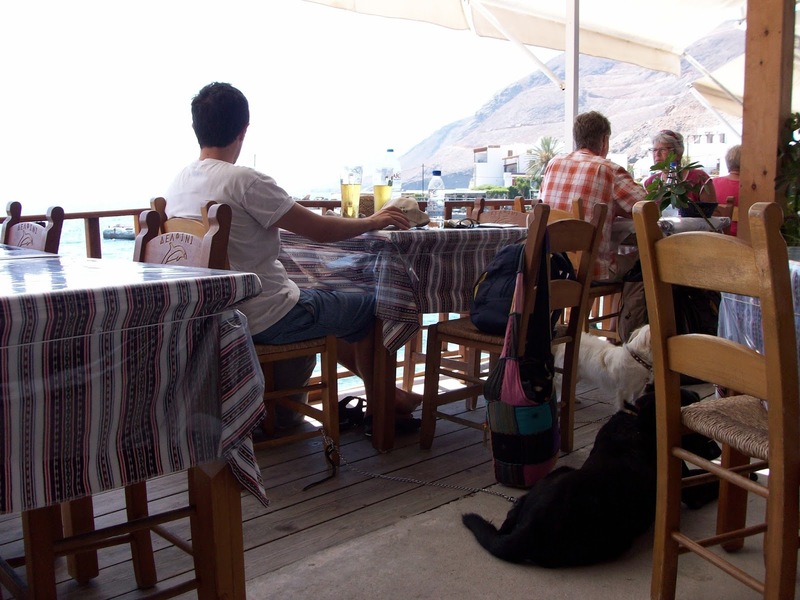 The taverna was fine about us having the dogs at our table, and there were not too many people around to feel like we were in the way. Prices there were a little higher than elsewhere in Crete, but not extortionate. Our ferry arrived, just a little bit late, around 6.30. 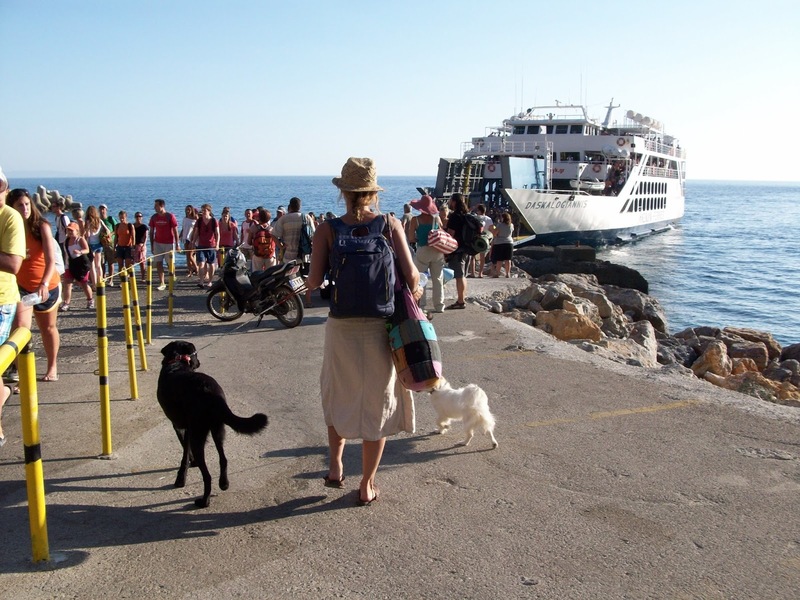 Streams of people were leaving the ferry as we waited, and I started to get very nervous about having the dogs on board. Luckily, there were not many people going in our direction. This first boat was the ferry, which accommodates cars too. 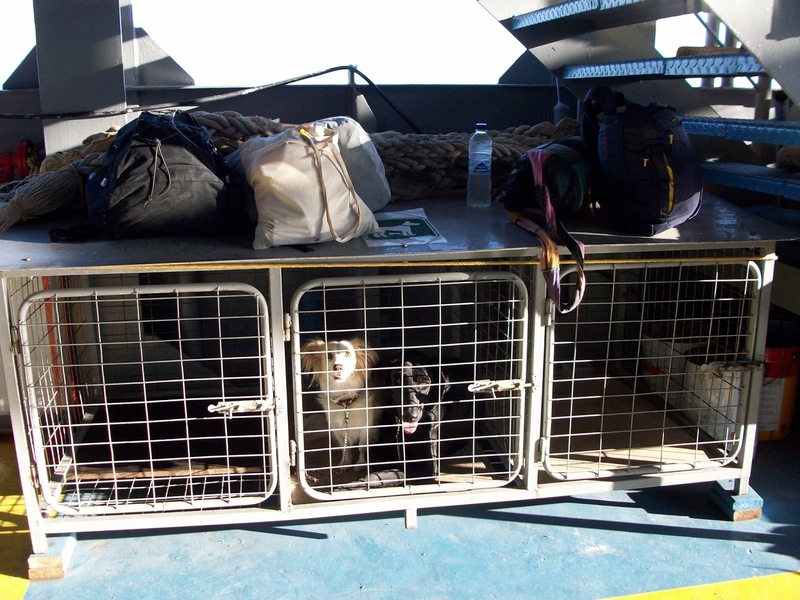 There are cages for dogs in the section where you leave your car, and it is not permitted to have your dog with you on deck - you must put them in the cage provided. But, we were allowed to stay down by the cage, and from there you could still see the dramatic landscape of the coast. 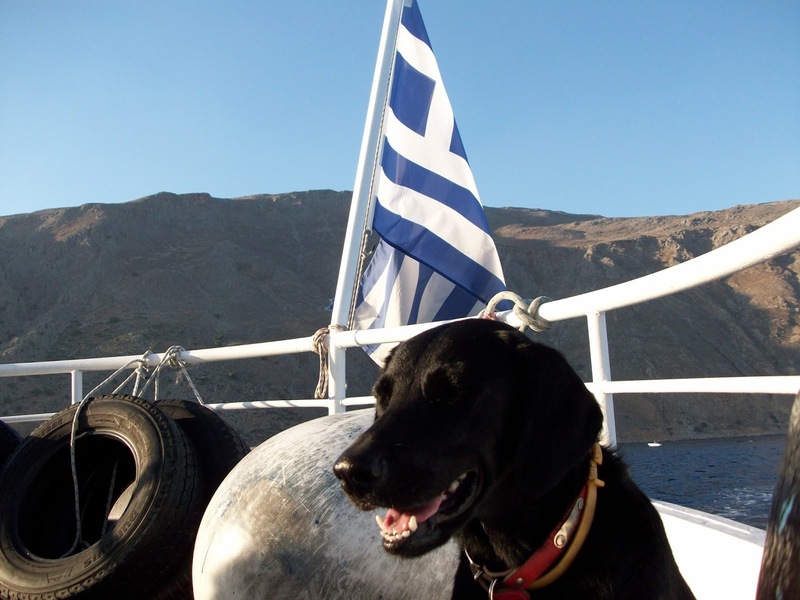 The staff were also very helpful and friendly to us and our dogs. I hadn't realised that we would have to change boats at the village of Loutro. 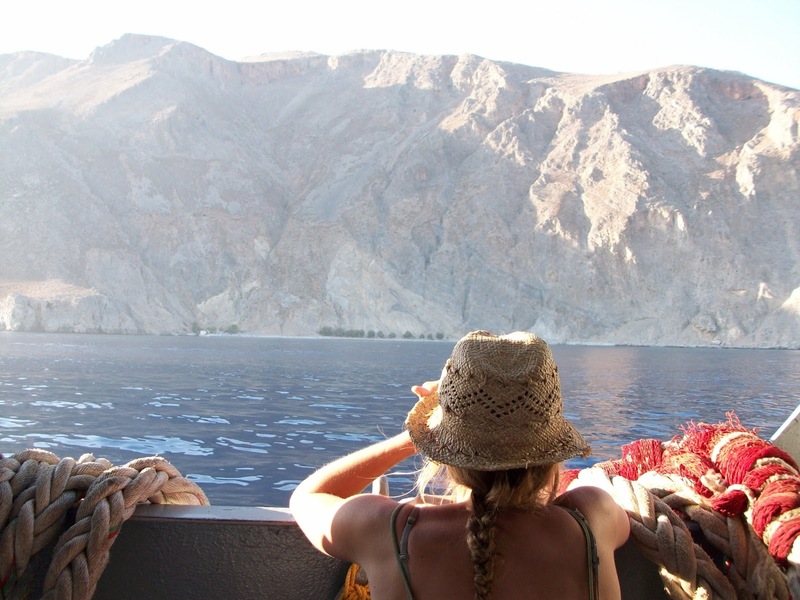 There are some direct boats from Hora Sfakion to Agia Roumeli, but others stop at Loutro and from there you continue on a smaller, passenger boat. I much preferred the second boat. 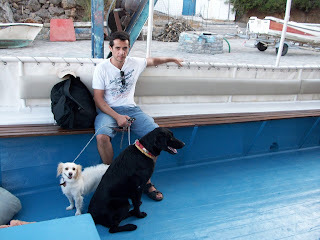 Firstly, we could sit together with the dogs. Secondly, it was more open and you had amazing views of the coast. Thirdly, it just felt more like an adventure. Loutro seemed a very pretty village. 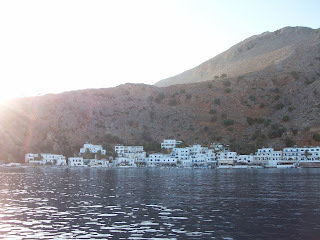 We didn't stop for long enough to explore, so I just saw it from the boat, but there are a small number of hotels and tavernas, again ranged along the harbour, and nearby you can find small coves and rocky beaches to swim from. I carried Betty on to the boat, while Sage managed to climb clumsily in by herself. Dogs are not allowed inside the cabin. 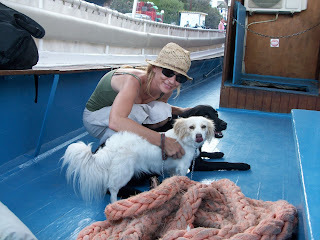 Again the staff were friendly and helped us onboard with our many bags, two excited dogs, etc. This journey was wonderful. Unless you brave the very long, dry hike along the sea front (which according to my E4 map takes about 7 hours), there is no other way to see this spectacular landscape. 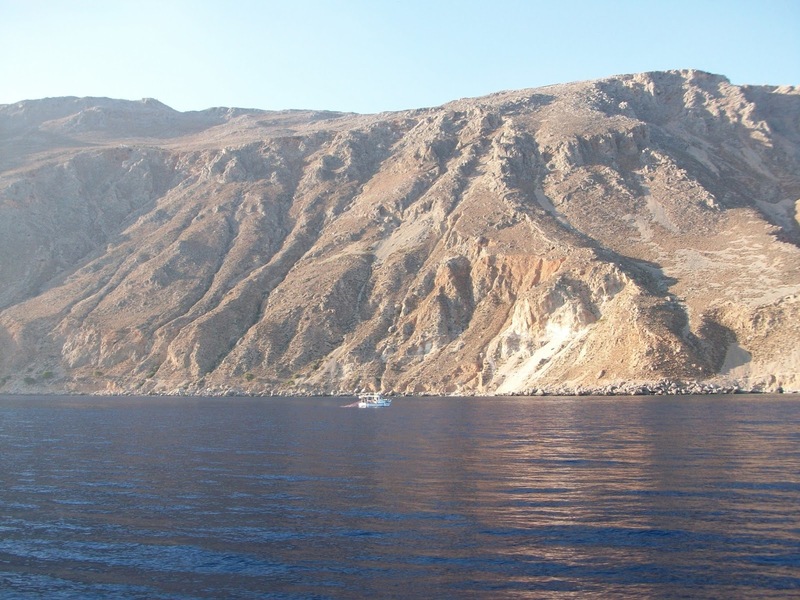 The coast is quite barren as you set off from Loutro. An almost solid wall of mountains plunge into the sea broken by just the occasional tiny cove. We were traveling in the early evening, and the light was fantastic, making the rocks glow a brilliant yellow against the dark blue of very deep sea water. Our girls were very well behaved. They didn't seem particularly anxious about being on a boat, more curious, I would say. Sage did some posing by the Greek flag, Betty mostly just sat on my lap and looked at the view. 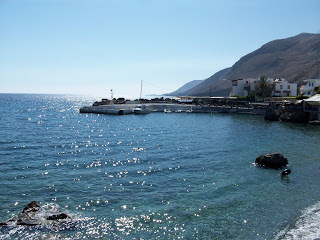 Finally we arrived at Agia Roumeli. Now we were faced with the choice of whether to find somewhere close by to settle down for the night, or to push on and arrive, probably in the dark, at Agios Pavlos. I had read that the footpath from Agia Roumeli to the beach was fairly even and easy to manage, and would take about 1 hour. Needless to say, we went for it. I should say that the footpath is not very easy, especially when you are carrying sleeping bags, water, provisions etc, and shepherding two dogs who have been cooped up all day on various forms of transport. It's also not that easy because a large part of it runs along the beach, so you are plodding through sand, and small pebbles get stuck in your sandals. It's also not an hour. It's not very wise to walk this for the first time once it has got dark. But, it's a nice hike. It's actually part of the E4 trail that continues on round the coast. After the beach section you pass up over some rocks through a woody area full of pine trees. Sage was off chasing lizards and crickets, relieved to be free to run around. Betty seemed to enjoy it, apart from being pounced on by a large excited Sage. 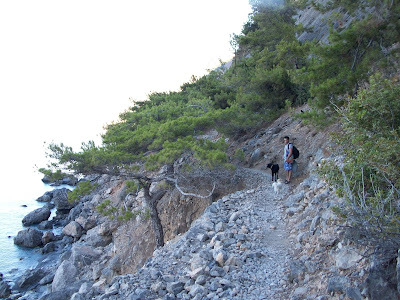 When it got dark, and we were still up on the rocks, aiming for a single bright light in the distance (the small taverna on the beach at Agios Pavlos, we hoped), we used torches to find our way. It took us about 1.5 hours, at a fairly fast pace. Finally, we found ourselves sliding down from the path on a small sand dune, right to the door of the a very welcome taverna.